I'm in downtown Salt Lake City for 8 days with Greg and Sam, and it's GORGEOUSLY warm and sunny. About 26 to 34 degrees Celsius (82 to 94F). Living the urban life - no car - and walking everywhere. 15,000 to 18,000 steps a day is easy to do. I'm a happy camper, and my feet are very happy. The Naturalizer Wendys are KILLER SUBLIME. Not a blister or rub on the first day of wear (about 15,000 steps). AMAZING and brilliant fit in the US6.5 Narrow width for my low volume feet. Incredibly comfortable and supportive. I think they look pretty in the white, and work with any casual outfit. Just duplicated them for next Summer. I swear you find things when you don't look for them. I LOVE the look of a pointy toe ballet flat, but they seldom fit, fall off my feet, and feel too flat. Repetto, Chanel and AGL are not a good fit at all - enough said. Then I tried these darlings from BR because the watermelon caught my eye - and I never give up. They fit like a dream, are very comfy, and look pretty, dressy and Modern Retro. Sufficiently supportive and not too flat. I adore their daintiness. Got them on deep discount too. I wore them out to dinner with friends over the weekend, and they passed the comfort test (about 4 hr shoes). They're like dressy pumps sans the heel. Perfect. Wore the new ballet flats with black cropped flares, a satin dress, blush bag and pearls. See exact items in Finds. AND, the silicone rubber toe protectors are working. I wear them with my loafers and sneakers. Glad you had such a wonderful time. Comfy shoes are worth celebrating! Give Sam a smooch for me. Thanks, Becky. Happy feet are the best, right? Still here in SLC. Sam sends a kiss back. Your happy feet look great! Those are wonderful shoes! They look super comfortable without *looking* like a comfort shoe. Perfect for the weather, too! I'm glad y'all are having such a great time. And I also have happy summer feet, because I ended up with these Rockport "Abbott" sandals about three weeks ago. They have scarcely been off my feet, I love them so much. ALSO in a narrow size - literally the last pair available on Zappos. I don't remember when my feet have been so happy! I just got back from San Antonio. We didn't do as much walking as we might have (not there to be tourists) but still did a fair amount, and these were absolute winners. I have even worn them in the kitchen when doing a lot of cooking. This is my comfortable level of flat. The "Aubrey" ran a close second - I just wanted an open toe for warm weather. Great to hear about your shoe successes. I like your yellow geometric top too. Special! Ever since I got my Naturalizers I have become slightly obsessive about insanely comfortable shoes that are not sneakers. I might never wear heels again except for formal events. I don’t walk that much, nor do I have fussy feet, but there is a HUGE happiness factor that comes with comfort. What a nice sandal, Angie. The airport shot is adorbs! Any interesting style differences between SLC vs Seattle? Naturalizer came through for me, just when I was about to give up on finding a comfortable slide. 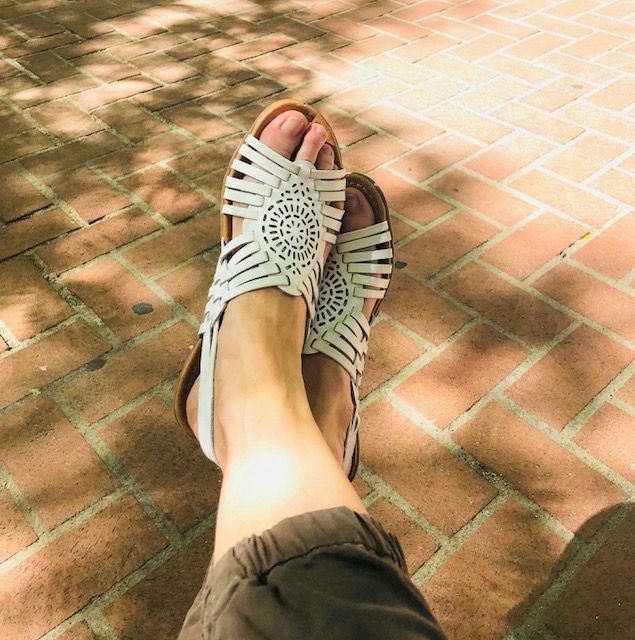 The wide, soft, leather bands of the Amabella hold the foot securely while hiding my bunions. There is a formed footbed that my arches love! YAY, Ginger. Those sandals are well suited to your style. Too high for me, but I can enjoy them on you. Waving at my narrow sandal mate. Jllp, Sam sends you a kiss too. YES. I've mentioned it before. People are a lot more polished and coiffed here in Salt Lake City compared to Seattle. Make-up, fixed hair and dressier attire. LOTS of dresses, skirts, wide crops, skinnies, straight crops and jumpsuits. Very few pairs of shorts, but lots of sleeveless and skimpy flowy tops. Children are immaculate. Smittie, all I can say is WELCOME TO MY SHOE WORLD. Fabulous! They look really pretty (both pair) and there is nothing better than happy feet. I walked 30,500 steps last Thursday in my EF Sport sandals. I admit, my feet were tired by the end of the day. And I did have one callous under my little toe. But all things considered, that was impressive. The next day I switched things up and wore the Vionic Solana. Loved the secure feeling and the arch support. After 15,000 I did get a few top-of-toe blisters (despite body glide) but the comfort of the arch support made it worth it! Congrats on your happy feet!! It's a challenge to find beautiful, comfortable shoes instead of settling on frumpy, comfort shoes. It's a surprise to hear you say AGL's don't fit you. I'd think they would. I love mine, but I have to admit, I can't rely on them as all day walking shoes (shopping yes/vacation/no.) I tried on Repettos in Paris--ouch! Sam looks so cute, like he's about to fall asleep. And you look lovely as always! Suz, THAT IS VERY IMPRESSIVE. WOW. Love your happy and stylish mega walking feet. Isn't walking the best? I have an energetic puppy in tow most of the time too (Thanks for the kind words). Dana, the AGL's come up to high on the sides and rub my boney feet. Thanks for the kind words. 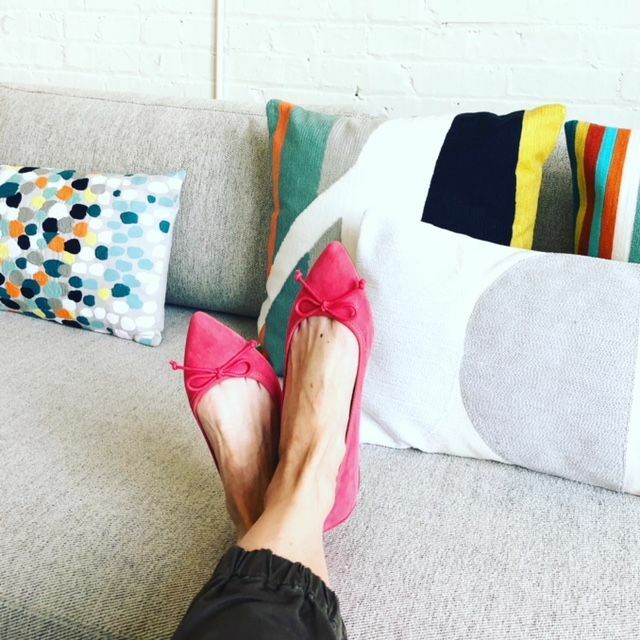 Love those BR flats - tempted to try them myself as I have the same experience you do with pointy toe flats. Nice price too ! Yay for happy feet! I am all for comfortable and pretty shoes. Yours are so pretty and look very comfy as well. Love your geometric top, and I can't help but comment how adorable Sam is. 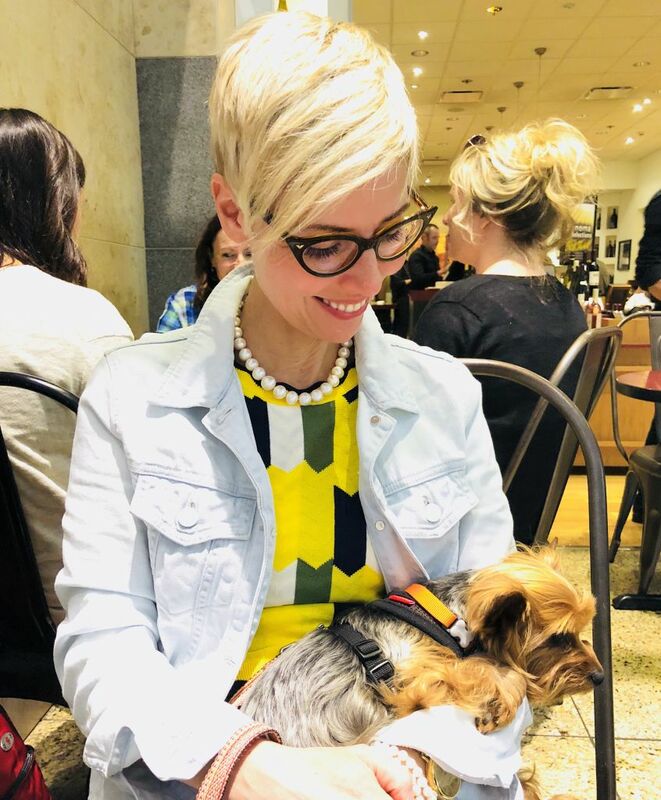 RunCarla and Angie, I'm a Naturalizer convert too! I also got the Amabella, in white. (I drank the white sandal Kool Ade.) I like how it's a similar shape to the Birkenstock Arizonas, which I always wanted but that don't fit my feet. The Amabellas have a cool modern look that I want to play around with a bit. Soooo comfy right out of the box! I love the Wendys too, but I wish I'd gotten them back when they'd been offered in blue. I can't find that color in my size anymore. Angie, you always look so polished in the heat! Brava! Dianna, you're always so gracious. Thank you, and hope you're settliing in nicely. Carla, what a RELIEF, and waving at my foot twin. Lisap, I don't find sneakers the most comfortable shoes, actually - apart from my fleece-lined Converse hi-tops that are sublime. And I guess neither does Suz! Athletic sneakers are not comfortable for my feet - it's very odd. Too wide and give me cramp after a while. I generally find a loafer and boots more comfy than a sneaker. Hope the BR flats work out for you too. Another Naturalizer convert, thanks to Angie's feedback/reviews. I ordered 2 pairs of the BR flat (pink and the pear color). Fingers crossed they have enough support for me. I love heals but over the years my feet are not so happy. Therefore, I am gravitating towards "low heal" and "flats" in my shoe collection. I have the Simonette's in a narrow and they are so versatile and comfortable!! Thanks for sharing your secrete to keeping mules on the feet. Never realized I am a narrow foot; go figure. HAH, mtnsofthemoon. Now you know. Knowledge is power, and welcome to Team Narrow Feet. Glad you've sorted the fit challenge and are on a good wicket with your footwear. High five. Wow, Suz. I stand (strike that, sit) in amazement and admiration. would be after that many steps. Christina, I believe it. Inge has the same experience with her Birkies. I live in downtown and I am walking everywhere and know how it's important to have comfortable footwear. Your shoes are fantastic and really good for hot weather. I usually wear sandals and ballet flats in summer. Angie, what are the silicon toe protectors? I wonder if they would work for me - I can't wear closed toe shoes without socks because they always rub on the top of my toe knuckles no matter how soft they are. You always look so polished, Angie! And your little travel buddy is beyond adorable too! Those huarache style sandals are growing on me. I think because the rest of your outfits are so immaculate that the more casual sandals look less casual somehow. I may drink the kook aid! Yay to comfortable feet and lots and lots of steps. My best kind of day! The ballet flats are so pretty. Well done Sam! It is so interesting to hear the variations between SLC and Seattle.